Temperature extremes are a gardener's enemy. Not many people care to sit in the blazing summer sun in August, but the shade garden is a respite throughout the growing season. For example, an inviting seat among beautiful plants turns people from garden spectators into garden participants. 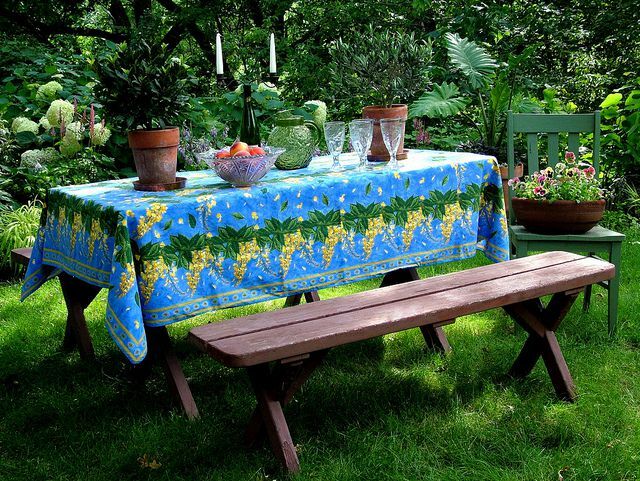 You don’t need to spend a fortune on your shade garden retreat; a colorful tablecloth and some flea market picnic ware add interest to any inexpensive patio set. Add a portable container garden filled with seasonal flowers and some hardy shade-tolerant perennials to complete the lush landscape. Explore 12 popular flowering plants that will help you love your garden again when temperatures soar. The number of coral bells cultivars available for the garden has grown so much in recent years that they may soon rival coleus for variety in foliage colors. The versatile heuchera was named Perennial Plant of the Year in 1991 by the Perennial Plant Association. The summer blooms are usually pink, red, or white, but the foliage can vary from chartreuse to midnight purple, with dazzling yellow, orange, and variegated types to choose from as well. According to Iowa State University Extension coral bells tend to be short-lived perennials, but new plants grow fast to fill in any gaps left by those that don’t emerge in the spring. Many shade gardeners couldn't imagine the shade garden without hydrangeas; their giant blooms and pest-free nature make them indispensable. Gardeners in southern areas can choose from many cultivars of big leaf macrophylla types, which include the popular blue and pink ‘Endless Summer’ variety. The panicle hydrangeas, native to Asia, are desirable for their large size (up to 15 feet) and cold hardiness to zone 4. In spite of the new and improved introductions in recent years, a classic is still the ‘Annabelle’ H. arborescens shrub, like the one pictured here, which produces masses of giant snowballs in summer without any coddling. You can grow hostas at the base of your hydrangeas, but gardeners looking for a burst of color can pair the shrubs with impatiens (seen here), caladiums, or begonias. Photos of astilbe plants in their prime have swayed many gardeners to try this hardy perennial, but what happens when plants are ratty and blooms are few? The secret to cultivating a thriving astilbe is water, and lots of it. The plants must never dry out, and a site near a pond or stream is ideal. Astilbes are slow-growing, and won't take over a moist spot like some invasive plants like knotweed or bush honeysuckle. A landscaping professional created this masterpiece from a mix of annual plants, like impatiens and caladiums, and perennials including asters, hostas, and ferns. If you’re attempting to landscape a large shady area from scratch, annuals can fill in the blank spots while you allow yourself a few years to settle on your favorite permanent specimens. In the shade garden, the use of texture and form is just as important as including different flower colors and blooming times. The pink flowers of bleeding heart and silvery foliage of dead nettle brighten the spring landscape. Don't worry if your bleeding heart plant disappears in August; plants may become dormant at the end of summer but will reappear in spring. Gardening under trees isn’t always easy, nor even always recommended, as some trees have shallow roots that don’t appreciate being disturbed by a trowel, and some flowers can’t compete with the water and nutrient uptake of trees. If you decide to plant a flower garden under trees, choose perennials like these rhododendrons and azaleas to avoid disturbing the tree’s root system every year. Pansies are a harbinger of spring for many gardeners, and they appreciate a bit of filtered sunlight to help prolong the bloom time into warmer weather. Pick a few pansy blossoms and pair them with some lily of the valley for a May Day basket or fragrant nosegay bouquet. A nice attribute about pulmonaria, or lungwort plants, is that they spread steadily (but not invasively) over the years to form a large colony where they have mostly shade and moist, rich soil. The seedlings look so cute, like little freckled versions of their parents, they may almost turn you into a person who talks to their plants. Almost. If you haven’t figured out how to successfully keep a fuchsia alive for more than a month, don't let that stop you from buying this finicky and fabulous plant. When you try fuchsias in the garden, place them in a site that receives morning sun, and filtered afternoon shade. A sheltered spot is idea: What fuchsias don't like is hot summer wind blowing on them like a hair dryer. Keep the soil moist, but not soggy, and feed your plants once a month with a basic fertilizer for annual flowers. The silvery foliage of brunnera ‘Jack Frost’ provides a striking background for the delicate clusters of blue flowers that appear in the spring. This hardy plant withstands zone 3 winters, forming a dense mound significant enough to be a standalone specimen, or you can divide the clump in the fall to get more of these heart-shaped leaves into your garden. This stunning flower is a mainstay in shady container gardens. Big, ruffled blooms are every bit as showy as roses, without the need for sun or chemical sprays. These annual flowers take a while to get going, so pre-sprout the begonia tubers in a sunny window, then move outdoors when nighttime temperatures stay above 50 degrees F. Keep plants moist, and provide a few hours of morning sun if possible for energy to make blooms.